First published as Beth Chatto's Woodland Garden by Cassell in 2002, this Pimpernel Classic edition includes an afterword by David Ward, Head Gardener at Beth Chatto's Gardens. "Most gardens have dark areas – a north-facing border, an area shaded by a hedge, fence or house wall, a bed in the shade cast by shrubs or trees with greedy roots – and for many gardeners these are a challenge, and often a trial. Fortunately there are plants adapted by Nature to a vast range of conditions and, by choosing suitable plants, we can transform almost any problem site into something beautiful." In this book legendary plantswoman Beth Chatto shows how the problem of shade in a garden can be turned to advantage. She tells how she transformed a dark, derelict site into a woodland garden that is tranquil and serene yet full of life and interest in every season. She describes, too, a wealth of plants that will thrive in shady beds and borders and on walls. 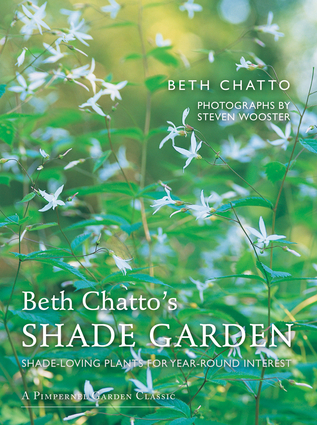 Beth Chatto was born in 1923. Her influence as a gardener and plantswoman extends worldwide. Her guiding principle has always been the right plant for the right place. If this hardly sounds radical today, it is largely thanks to her work – when she first put her principle publicly into practice at her Unusual Plants stand at the Chelsea Flower Show in 1977 she brought about a quiet revolution in the gardening world. As well as creating her garden and nursery at Elmstead Market in Essex, she has written gardening classics including The Dry Garden (Dent, 1978), The Damp Garden (Weidenfeld & Nicolson, 1982), The Green Tapestry (Collins, 1995) and Drought-Resistant Planting (Frances Lincoln, 2000). She was created OBE in 2002 and also holds the Royal Horticultural Society's Victoria Medal of Honour. Steven Wooster is a garden photographer and a graphic designer. He won the Garden Media Guild Award for his photographs in Beth Chatto's Gravel Garden.